Relax with homelike comforts and warm hospitality at DoubleTree by Hilton Hotel Minneapolis North. Savor our warm DoubleTree cookie at check-in and retreat to your spacious guest room or suite. Each guest room boasts contemporary decor and modern amenities including an HDTV and complimentary WiFi access. Upgrade to one of our stylish suites and enjoy extra space with a separate living area ideal for families or an impromptu business meeting. With over 10 000 sq. ft. of meeting and event space a 24-hour business center and on site audio-visual support business is easy at this Brooklyn Center MN hotel. 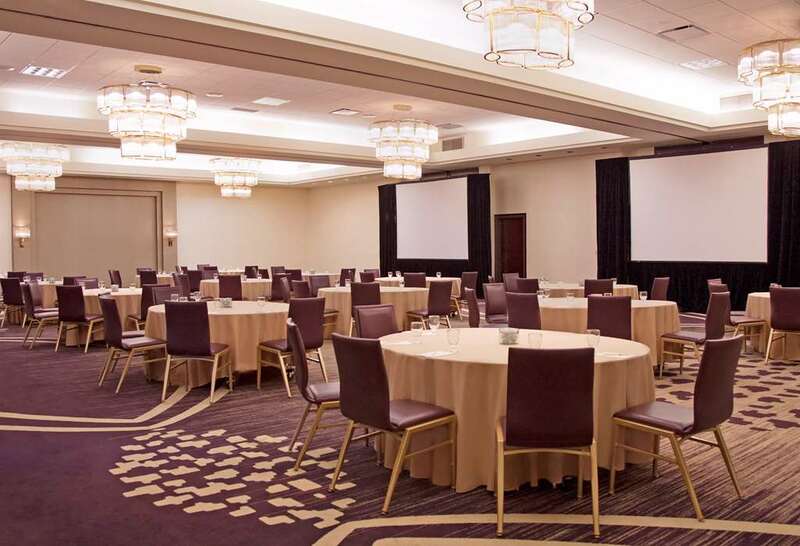 Choose from 10 professional meeting rooms for events with up to 300 guests. Our DoubleTree hotel also offers an ideal setting for elegant weddings or evening receptions. Wake up to a delicious hot breakfast in Lombard*s Restaurant then enjoy traditional American classics for lunch and dinner. Whether you crave a hearty meal or a tasty light bite our expert chefs can cater to your needs. Grant*s Lobby Bar also offers a relaxed and informal setting for pre-dinner drinks or a light meal. Maintain your fitness regime in the modern fitness center or swim laps in the indoor pool. For outdoor activity a seven mile walking trail is located just outside the hotel. In-Room Dining: Relax in the comfort of your own room and dine on our delicious cuisine. Order an energizing breakfast to start your day or food and beverage all day long through a late night meal.